If any club has changed its web address so the link no longer works, simply google the name to find it. In addition to joining a club you might consider joining the National Trust since many slopes are on Trust land. The Trust now charges £4 for non-members to park at any National Trust site, so membership is worthwhile. All obvious stuff really ... but there's always one isn't there? Radio control glider fliers are lucky in that all public access land is potentially usable by them. 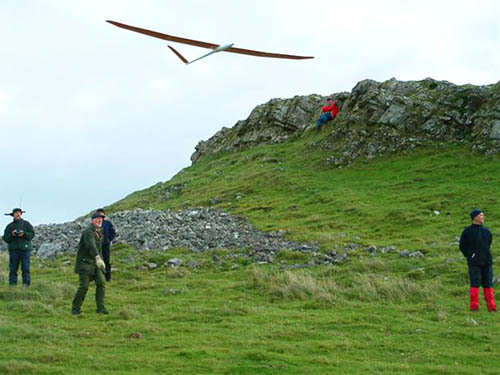 Model glider flying is counted as an "outdoor recreational pursuit" and the public has the right to carry out such pursuits on public access land. However paragliding and hang-gliding are excluded from being "outdoor recreational pursuits". This means they cannot fly on public access land unless a specific licence is in place. As a result many of the slopes featured on this website never see a paraglider. The slopes that do have a paraglider licence can get quite busy with paragliders when the wind is low enough for them (below 10mph or so). The existence of a paraglider licence does not in any way limit the right to fly model gliders at that site. However, since paragliders can only fly at a limited number of sites, and only when the wind is fairly low, perhaps the gentlemanly thing to do is to give paragliders a "fair crack of the whip" when they are there. Often there is an agreed bowl that the model flyers use, and another agreed bowl that the paragliders use. It is wise for model flyers to allow paragliders plenty of airspace and give them right of way even if they seem to have strayed into the model glider area. The paragliders' national body offers excellent advice on sharing slopes: BHPA Policy.